What do your wedding dreams include? Perhaps being barefoot on a tropical beach or exchanging vows with a stunning ocean horizon as the backdrop? Whatever the details and size of your dreams, Oasis Hotels & Resorts are ready to make them an extraordinary reality. All of the brand’s Romance Collection Resorts feature a variety of romantic ceremony and reception locations. 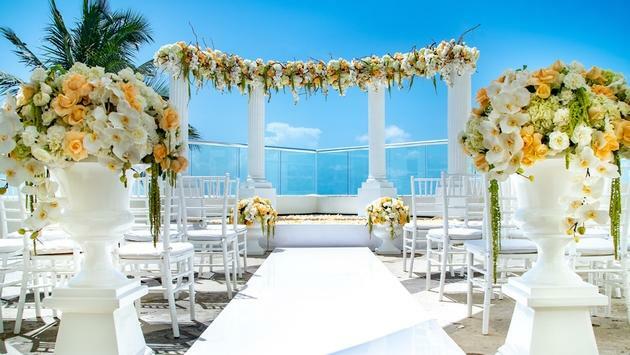 Ceremony options that are part of Weddings by Oasis include a Seaside Spectacular beach wedding, Oceanfront Terrace vows, Glorious Gardens gatherings or the more traditional Catholic Chapels. Reception options, meanwhile, range from Seaside Celebrations to a Poolside Party or a Terrace Affair. Arena Banquets or Reserved Restaurants are additional choices. And did we mention the complimentary wedding package available? The O Remember package is free for couples who have accumulated a required minimum number of room nights at the resorts (65 nights). This is just one of the many packages offered by Oasis Hotels & Resorts, which has properties in Cancun in Tulum. To help you make the all-important decisions about how your wedding day will unfold, Oasis Hotels & Resorts also offer a “Wedding Preview Visit” package. It’s an opportunity designed to allow couples to tour the brand’s variety of breathtaking beachfront and tropical venues, sample gourmet menus and wedding cake options during private tastings and see first-hand all of the ways a wedding can be customized. Additional preview options include experiencing the spa with a hair and makeup consultation, meeting the property’s photographer and even enjoying a trial run photoshoot. Couples who book a preview visit receive a $350 credit for the experience if they book their wedding with Oasis. And not to be overlooked, honeymoons are also a much-anticipated part of the wedding experience. Oasis Hotels & Resorts is prepared to make those unforgettable as well. Honeymooners are able to enjoy each other in a beautiful, relaxed setting and receive special VIP treatment, including complimentary honeymoon amenities. There’s also a variety of honeymoon package upgrades available, starting from $350 up to $1300. The packages include such things as romantic gourmet in-room breakfast, Kamasutra kits, a romance concierge and discounts on spa treatments and the professional assistance of a wedding planner. At Oasis Hotels & Resorts there are truly options to suit every type of couple and every budget, whether you’re dreaming of an intimate wedding for two or an enormous celebration that includes family and friends. It’s all about you, and your wedding dreams.